Deadline for entries is 19th May 2019. Entries received by 4th May will be entered in a draw for £25. Display must be in place by end of 24th May until 16th June. •	Display must be visible from the public highway. •	Please check that you are within the boundaries of Alsager, email if unsure. 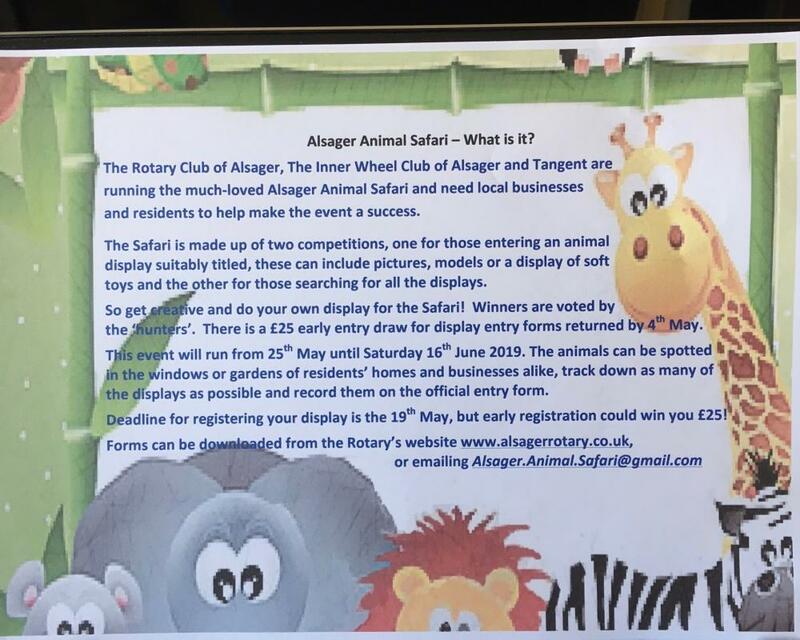 •	To register your entry please return the form along with a Minimum donation £4, cheques payable to ‘The Rotary Club of Alsager’	to the address below. Entry forms will only be available once all display entries are known, this will be the week commencing the 20th May, forms will be distributed by Friday 24th in time of the Safari. To reserve your entry form, please send a minimum donation of £4 (cheques payable to ‘The Rotary Club of Alsager’) to the address below.